The administration of this college is run by the Managing Committee, appointed by Sant Vinoba Shiksha Parishad, Deoria. Sant Vinoba P.G. 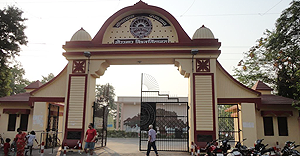 College Deoria is one of the premier colleges of the D.D.U.Gorakhpur University, Gorakhpur. The college was established by the trust “Sant Vinoba Shiksha Parishad” registered in 1960 under Society Registration Act. 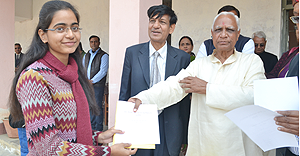 It was established with a clear vision and mission of spreading education in this remote area of Uttar Pradesh. The main objective of the college is to work for the transformation of the prevailing social conditions so that the values enshrined in the Constitution of India like social justice, equality of opportunity and democratic freedom to all may be brought closer to realization. 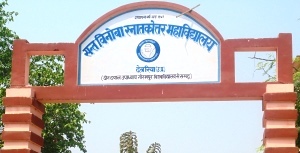 Sant Vinoba P.G College is an important institution of higher education in Deoria. It is situated in the heart of the city and is about 2 km. away from Deoria Sadar Railway Station and U.P. Roadways bus stand. The college was established in the year 1961. Honorable Late Pandit Nand Kishore Tiwari, a great social worker, a pioneer of educational renaissance in Eastern U.P. and an elected secretary of District Board, Deoria was instrumental force in opening this college. He had formed a trust known as “Sant Vinoba Shiksha Parishad, Deoria” in 1960 with an aim to provide value oriented education in this remote area. To produce enlightened, intellectual and spiritually sound human beings who can contribute to our national development and serve our society with our motto ‘Vidyaya-amrit mashnute’ which means ‘Education leads us to immortality’. To create a student oriented learning environment conducive to the pursuit of knowledge. To promote peace and harmony among people of different faiths. To promote awareness about Gandhian and Sant Vinoba Bhave’s idea of education. To sensitize them regarding ecological, environmental and socio-economic issue through co-curricular activities. Educate and train manpower for national development. Pay special attention to the improvement of social, economic condition and welfare of the people. To promote character building in youth as an integral part of education. To inculcate the ideal of ‘Vasudhaiva Kutumbakum’ in students. Examinations are conducted as directed by the University. Strict adherence to rules is obeyed. Fair examinations are done every year. No unfair means is tolerated. Practical exams are also conducted seriously and examiners come from outside the college.